Home > news > Adriatic Test Case: Is MedFish4Ever all talk and no fish? Adriatic Test Case: Is MedFish4Ever all talk and no fish? Within Europe’s most degraded sea, the Mediterranean, lies the Adriatic, and at the centre of the Adriatic Sea lies the Jabuka, or Pomo Pit – a place of superlatives for marine life and fisheries. But the survival of its extraordinary environmental and economic values is on a knife-edge as the EU Commission considers whether to advocate for its protection as a Fisheries Restricted Area closed to bottom trawling. Just four months ago EU Commissioner Vella unveiled the MedFish4Ever Declaration by the EU and Mediterranean countries – declaring it a historic agreement that will recover Mediterranean fisheries and secure a sustainable future for them. Will Commissioner Vella and the EU Commission start walking the talk of MedFish4Ever and deliver some real protection for Med fisheries by protecting the Jabuka/Pomo Pit from one of the most destructive fishing practices?? A unique marine site, the Middle Adriatic Pit, also known as the Jabuka or Pomo Pit, is host to the most important Adriatic nurseries for the dangerously overfished European Hake and Norway Lobster (langoustine, or Nephrops norvegicus), among others. 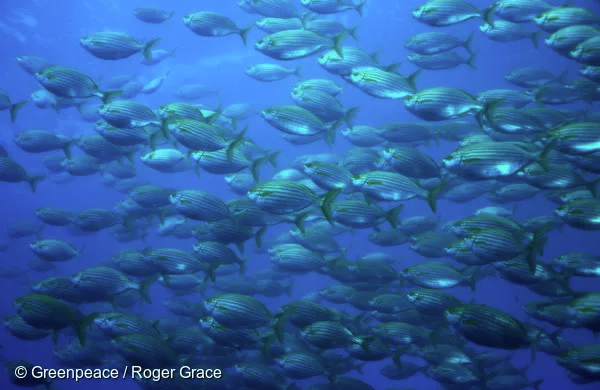 These economically valuable fish stocks are in desperate need of relief from intensive overfishing in order to restore their numbers. Vulnerable cetaceans and sea turtles also depend on the area, and it is home to a number of Vulnerable Marine Ecosystems – some of our most special and sensitive marine ecosystems. The Scientific Advisory Committee to the General Fisheries Commission for the Mediterranean has already endorsed a Fisheries Restricted Area proposal for the Jabuka/Pomo Pit closed to trawling. It’s all lined up. Commissioner Vella and the EU Commission are now in a unique position – they can begin to drive the permanent protection of this valuable place and marine life, if they propose a strong, science-based, Fisheries Restricted Area to the General Fisheries Commission for the Mediterranean in October that matches the rhetoric of the MedFish4Ever Declaration. Or they can give in to the demands of the Italian trawl fishing industry and allow the most destructive type of demersal fisheries to continue, rendering the Fisheries Restricted Area meaningless and delegating MedFish4Ever to history as just another piece of paper. Commissioner Vella, are you willing to do what it takes to get everyone swimming in the right direction, so that we can truly have MedFish4Ever? 21 NGOs signed and sent the following letter to Commissioner Vella on 31 July 2017, urging him to ensure that an EU proposal for a Fisheries Restricted Area in the Jabuka/Pomo Pit delivers the protection guaranteed by the MedFish4Ever Declaration. Subject: Urgent call for a Fisheries Restricted Area in the Jabuka/Pomo Pit closed to demersal fisheries. the Jabuka/Pomo Pit, in the central Adriatic Sea, is a site of unique productivity due to the physical processes influencing the dynamics of water circulation and nutrient delivery to this area. In particular, the Pit hosts the most important Adriatic nurseries for European hake, Norway lobster and others valuable species, such as horned octopus and monkfish, making it a critical area for the recovery and sustainability of these stocks and the fisheries that depend on them. The Jabuka/Pomo Pit is also a key area for vulnerable species of cetaceans and sea turtles and a suite of Vulnerable Marine Ecosystems (VMEs). Last May the Scientific Advisory Committee (SAC) of the General Fisheries Commission for the Mediterranean (GFCM), endorsed a proposal for the establishment of a Fisheries Restricted Area (FRA) in the Jabuka/Pomo Pit, with a core area closed to demersal fisheries and a surrounding buffer area with limited and monitored fishing . The proposed FRA covers the waters closed to trawling through a bilateral agreement between Italy and Croatia in 2015, which took into account the advice of AdriaMed scientists. The Pit was then re-opened to trawling in 2016 due to pressure from the Italian fishing sector, depriving the area and its nursery and spawning grounds from the much needed protection. Recently, following the growing support for a FRA in the Jabuka/Pomo Pit, Croatia and Italy agreed to reintroduce a fishing closure from the September 1st 2017. Because of their critical and irreplaceable importance to the Adriatic broader marine ecosystems and ecosystem services, the Pit Essential Fish Habitats deserve lasting conservation measures to ensure that national political shifts do not reverse established protection, as it was the case in 2016. We, the undersigned organizations and groups, call on you to propose the establishment of a Jabuka/Pomo Pit FRA closed to demersal and recreational fisheries at the next GFCM Conference (Montenegro, 16-20 October 2017). A proposal by the EU following scientific advice, would be fully consistent with the CFP. A FRA in the Jabuka/Pomo Pit would also create a level playing field in the Adriatic by extending the current fishing ban introduced in area by Croatia, to other fleets in the region. Based on scientific information available to date, anything short of a FRA closing the Pit to demersal fisheries is unlikely to be effective in rebuilding Adriatic depleted stocks and would fell short of the MedFish4Ever Declaration objective to recover fisheries in the region. Introduces a ban on demersal fisheries including towed nets, bottom set nets, bottom and mid-water longlines and recreational fishing. Defines the waters closed to demersal and recreational fishing according to the proposed FRA core area endorsed by the SAC in May 2017. Includes a buffer area where fishing activities will be restricted and only allowed to authorized fishing vessels. Provides mechanisms for monitoring the status of the EFHs and VMEs in the area. Strengthen MCS measures to ensure full compliance. 20000 Milja– 20.000 Leagues Marine Explorers Society. “The Scientific Advisory Committee requested the Commission to consider the establishment of a new GFCM FRA in the central Adriatic Jabuka/Pomo Pit, on the basis of the technical elements and coordinates provided in the FRA proposal”. Nineteenth session of the Scientific Advisory Committee (SAC) Ljubljana, Slovenia, 16-19 May 2017.